Notice: there is a lot of theoretical questions. Recently I'm reading about Puppet (and similar systems), which - as I believe - can make my work easier, a lot. But I try - and unfortunately can't - to understand what all I can "puppetize". I can imagine "clouds" or HA clusters, where is the same config on more servers. But what about workstations? I have one pc (centos with kvm), one notebook (fedora) and personal server, can (or should) it be puppetized? What are (dis)advantages? Or in our company we have hundreds of servers (mainly with centos), but each of them is a little bit different. Can't decide if it's better to have a lot of configs on one place.. (Dis)advantages? I will be happy for all your opinions or links with this topic. The willingness of the automation staff to write automation for every. little. thing. The cultural conditioning that allows "I'll just change this one thing, it's a one-off anyway" to turn into "I'll just change this one thing in this puppet manifest, and apply it now; it's just a one-off." The degree of heterogenaity in an environment. It is definitely possible to puppetize every ********** thing that can be puppetized, but getting there requires the right culture and buy-in from everyone that can touch a puppet-able device. Some devices are fundamentally hard to manage that way, things like workstations, and puppet is better as a staging tool than a configuration management engine. Puppet is awesome when you're managing a fleet of VMs all doing largely the same thing. Total win, and not a lot of effort to get there. On the other end of the spectrum you have what I had at my last job, which was 200+ servers providing 130 services and only a small group of them doing so with more than one machine. There are absolutely companies (and universities) that have puppeted that kind of thing, but it's a lot of effort and takes a lot of buy-in. It requires that the first step of your new-machine deploy process not be "Install OS", but "create manifests". Ultimately its an effort vs efficiency cultural issue you'll have to solve among all of your IT staff. Anything that's reasonably similar across all systems (or a subset of them), or that you can base a template off a fact you can get out of facter is fair game. Things that are really unique you probably shouldn't bother, and should just serve the configs out of a filebucket. What falls into either category is a decision we can't make without knowing your environment intimately, so that's for you to figure out. I think others have covered the why so I'll take a shot at the how. I think by understanding how someone might use Puppet to do what you want, it'll make the decision clearer. Your Puppet module for Apache shouldn't do much by default. Install Apache, config it to a minimum standard, and start the service. Make this work on all distros you need to support. We need to add vhosts. You'll end up with a system that can drop file or remove them from a set of conf.d or vhosts.d/ directories according to what you need. Same thing with enabling or configuring modules. Rather than overload our default Apache module to do exactly what we need for a particular host or group we should handle this is a role or hostgroup class. 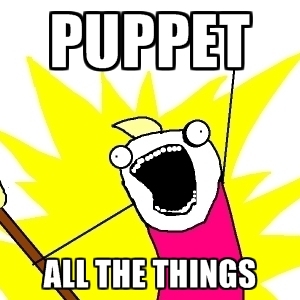 I'm a big fan of letting Puppet's Hiera, think of it as a database for Puppet, store the special bits. If a certain host or hostgroup needs a special setting, first put a sane default into the module so that normal users don't need to know about it. Then insert data for those special hosts or hostgroups so Hiera can consume it pass it to Puppet as needed. My use case is Listen port. Some servers have a Varnish or haproxy in front of them. By default the Puppet module has Apache use port 80, but if Hiera finds data it will override that default. I'm currently in the transition between Puppetize reasonably similar systems to Puppetize everything and am convinced that long-term, Puppetize everything is a better approach. If you version control your Puppet manifests (we all do this, right) you gain all the benefits of version control for your infrastructure. Your team becomes operations engineers. This is as important for special, one-off systems as homogeneous cattle farms. You get a log of who changed something, when they changed it, what the exact change was, and the ability to roll back the change. Personally, I also find that forcing myself to make every change through Puppet makes me think more carefully about the change. As I'm writing manifests, I'm more attentive to each change than I typically am hacking away at the command line. Your Puppet modules will also become better. Do you have more than one Nginx module? Maybe that means your Nginx module isn't that great, and you need to make it flexible enough to handle all your special needs. At least abstract the similarities into a core Nginx module that you extend for "custom" modules. Further, how confident are you that you can restore all your special needs servers to their current state (with respect to configuration) when the disaster happens? If every change needed to get a factory Ubuntu server into your internal wiki is Puppetized, you can easily rebuild the current state of your wiki, yesterday's Tomcat memory tweak by Bob included. Finally, this can be really hard. Managing lots of very different servers can lead to some hacktastic Puppet code if you don't take the time to do things right. If you aren't using Puppet Enterprise, consider hiera and/or an ENC such as Foreman to help separate your data from your manifests. Ever day Puppetize something else. Have a coworker drive while you explain how this works in Puppet. Each change will get easier. Not the answer you're looking for? Browse other questions tagged linux centos puppet cms or ask your own question. Why is it so difficult to upgrade between major versions of Red Hat and CentOS? CentOS or OpenSolaris for Xen dom0? Best way to manage third-party / custom-built software with Puppet? What is the correct way to install software RAID 1 in CentOS 6.4? Puppet ensure file is directory OR link. Or ensure directory only if absent?